Berry is in bed with a cold, but plans a trip to New York for a lunch with Emily Vanderbilt Hammond. Berry hopes that Campbell and her daughter Virginia will be at the lunch as well. 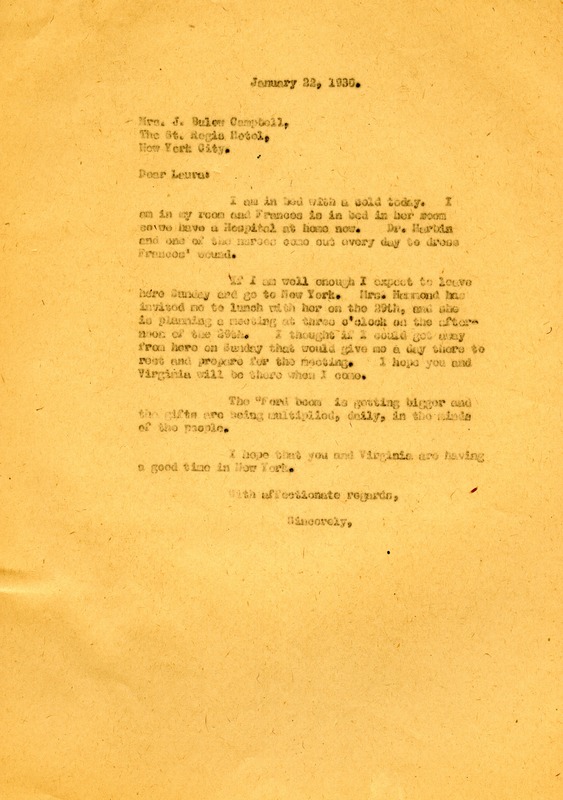 Martha Berry, “Letter to Laura Berry Campbell from Martha Berry.” Martha Berry Digital Archive. Eds. Schlitz, Stephanie A., Sherre Harrington, Chelsea Risley, Alan Henderson, et al. Mount Berry: Berry College, 2013. accessed April 20, 2019, https://mbda.berry.edu/items/show/11964.